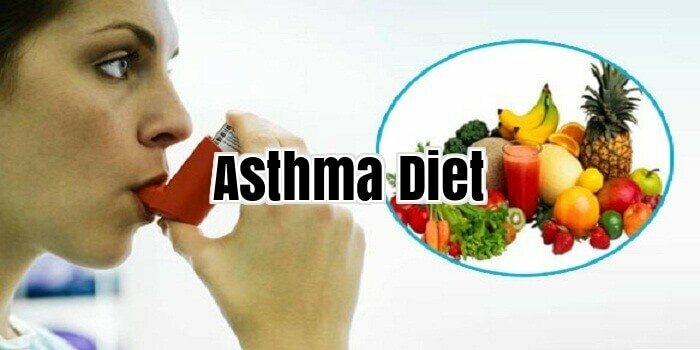 1 Is an Asthma Diet Important? 1.1 Does an Asthma Diet Play Any Role? 8.1 Food or is it Poison? The word ‘asthma’ means ‘panting’ in Greek. This refers to its main symptom – breathlessness. This is an ailment, which attacks the respiratory system whereby the airways constrict as a result of inflammation, causing the patient to gasp for air. Asthma is the result of an allergic reaction of the airway in two stages. The initial stage is when the airways constrict in response to certain allergens or triggers blocking the airways. And the second stage is when the reaction worsens causing inflammation, fluid retention and mucus formation. Some examples of food not part of an asthma diet would include curd, cucumber, vinegar, tomato sauce and foods which contain preservatives sometimes, trigger asthma. Often this is because the person is prone to a cold, and these foods enhance the effect. The good part is that once the trigger is removed, the asthma will subside to normal, unless the exposure is for a long and consistent period. Asthma diet advice can be difficult to acquire and follow, because there are many factors involved in the successful treatments for the disease. The attacks may be caused by many different trigger components, leading to confusion about exactly what the patient should be eating. There is also the problem of unhealthy weight, which is closely linked to asthma attacks and which needs to be addressed in the right way if optimum relief from symptoms will likely be achieved. It needs to be understood at the outset, of course, that no diet could hope to cure asthma. It really is more a case of avoiding everything in the diet which can induce an attack, while at the same time sustaining the overall health of the body so that the sickness can be controlled and taken care of. It is extremely unlikely that dietary factors are involved in the causes of bronchial asthma, although certain additives and also pollutants found in processed foods can certainly trigger an attack in someone who was already susceptible. There is a link between food allergies and asthma, and lots of asthma sufferers do find that certain foods can trigger signs or symptoms. These do not have to be abnormal foods full of artificial ingredients, or even foods grown utilizing chemical pesticides. There is no doubt that certain foods can act as exacerbating elements for an asthma attack, even if they cannot directly cause it. Everything which creates an excess of acid in the stomach is likely to be an adverse factor in any illness you are suffering from, as it will put excess pressure on body systems. Food which bloats your stomach is also a definite no-no as this can constrict the breathing passages. Evidently this does not directly cause the asthma attack, but it can certainly help make one which was caused by other factors considerably worse. One of the most critical aspects of an asthma diet is in maintaining a leaner body weight. Obesity is linked along with asthma, and there is no doubt that it could make symptoms considerably worse. When an asthma sufferer is also obese, their inhaling and exhaling is constricted by surplus fat even when they are not suffering a panic or anxiety attack, so when one starts they are inevitably going to feel all of it the more. On top of this, an asthma sufferer is often unable to burn off any calories by exercising as this can also trigger bronchial asthma attacks. If you cannot exercise, it is absolutely critical to keep your calorie consumption to a low level. It can seem to be that you are being attacked from all sides when you desperately need to shed weight to help your condition, but you can’t do so because you are prohibited from exercising. There is a response, although it will take some willpower to put it into practice at the start. Eat food which is high in nutrients and low in calories, and keep your calorie intake down. If you are hungry, eat food which makes you feel really full such as whole wheat bread. Exercise very gently to make sure that you never put pressure on your breathing in. A combination of a sensible asthma diet and the appropriate gentle exercise can see the weight coming off without the need to strain anything or take unnecessary risks. Over time this will decrease pressure on the breathing passages and make the condition easier to manage. It will likewise have a positive effect on the rest of your health. Be certain to do your exercising away from roads full of traffic, as they are highly harming and a risk factor. Exercise gently in natural environments, and stick to your healthy asthma diet. The best menu for preventing allergies is the rotation diet. This involves eating different kinds of foods each day and not repeating an item for 4 to 7 days. Use grains as an example, if rice is eaten on Monday you might use millet on Tuesday, wheat on Wednesday and oats on Thursday with rice eaten again no sooner that Friday. This type of diets keeps the body from overreacting to most foods although some items will still need to be completely excluded. Milk, for example, may cause a reaction each time it is taken. But the majority of people can safely enjoy most food with a rotation diet. Note that besides minimizing allergic reactions, a rotation diet provides the added benefit of ensuring that you consume a wide variety of nutrients. Also, keep in mind that certain nutrients help build up immune response. Such nutrients can be obtained, first and foremost, from freshly squeezed juices, sprouts, grains, and legumes. For mild allergies, a few changes in diet alone may be enough, but sometimes a doctor trained to see relationships between individuals and their surrounding, known as an environmental physician, may be needed to help get to the root of the problem. Sufferers of asthma life – you can reduce the frequency and severity of your attacks! How – they ask? As we all know, our diet plays an important role in all the major health problems we face, the following information is a guideline for the asthma lifetics out there. While it might work for most of you there will be others that do not get the same results. By changing your diet you can help reduce the hyperactivity of your immune cells, thus making them less responsive to allergens and air pollution. By increasing your intake of certain nutrients you can neutralize the production of free radicals and this could reduce the attacks and improve your lung function. A diet high in vegetable oil, salt and hardly any fruit and vegetables will increase the asthma life severity and frequency, whereas a diet high in vegetables, fruit and fish will lower these asthma lifetic problems. 1) Fresh fruits – these are high in vitamin C and E, contain beta-carotene [beneficial to your lungs] and many other nutrients. Fruit also contains antioxidants and these help protect our lungs [and bodies] against pollution. Try to eat as many fruits during the winter months [we all tend to forget fruit in this cold period] as you would in the summer months, this will prevent a decline in the lung function during winter and make you less susceptible to lung infections. Do not forget to eat the skin of the red apple, the skin contains a powerful antioxidant called Quercetin which is natural anti-histamine and anti-inflammatory, these will help lower the severity of a asthma life attack. 2) Green vegetables – yes I know, not everybody likes to eat these but do try as these contain bio-flavonoids which help in the reduction of free-radicals [which can harm healthy tissue]. 3) Fresh fish – rich in omega 3 fatty acids [helpful in reducing lung inflammation] and a good source of protein, try to include at least 2 or 3 servings of some baked fish every week as this will help restore a good balance of the essential fatty acids in your system. 4) Extra-virgin olive oil – is very tasty and high in monounsaturated fats which have excellent health benefits. By replacing the other fats you normally use with olive oil, you will find an improvement/reduction in your asthma life attacks. Try using olive oil over your salads instead of refined salad dressings. 5) Reduce your salt intake – using too much salt has been shown to increase the incidence of asthma life, so instead try using natural spices like sage, coriander, ginger and turmeric. Not only will these increase the flavour of your meal but they also contain antioxidant abilities which help neutralize free radicals. Dairy products [including milk] as these tend to increase the severity of asthma life symptoms and attacks. Mucus forming foods, these aggravate respiratory conditions by increasing the mucus in your airways thus blocking and aggravating the respiratory tract. These include chocolate, bread, sugar, cakes and refined flour to name but a few. * Vitamin A – lack of this vitamin can result in susceptibility and/or increased bronchial problems [especially in infants]. A good source of this vitamin can be found in foods such as carrots, tomatoes, strawberries, apricots and spinach. * Vitamin C – very beneficial for the active asthma lifetic who experiences hyperactive airways during and after exercise. This vitamin is found in many vegetables and fruits – spinach, parsley, oranges, etc. * Vitamin E – lowers the risk of asthma life if consumed in large quantities, also improves the lung function quite noticeably. It can be found in sunflower seeds, mustard and turnips to name but a few. * Lycopene – benefits the active asthma lifetic just like the Vitamin C does and can be found in guava, tomato, watermelon and red peppers. Asthma can be a lethal for some, and annoying for others. Statistics suggest that cases of asthma life are rising annually, as more and more children and adults are diagnosed with this dangerous condition each year. Asthma is the most common the lung of adult condition reported in the United States. Fortunately, there are foods that will help in our fight against asthma life and its symptoms. Researchers and scientists are becoming more interested in the role of the diet in prevention and treatment of a growing list of diseases, this research includes studies into the ways a diet will affects asthma life symptoms. A recent study on the effects of certain foods on young children with asthma life, which focused on foods that help to control asthma life symptoms, found the children that where consuming full fat milk, butter and other dairy products of this nature reduced the chances of developing asthma life. Additional research confirmed that the children that consumed these full fat dairy products also experienced a reduction in wheezing, than those who did not consume these types of foods. This study suggests that full fat dairy products are a food that will help combat asthma life. Whole grain foods have also been found to assist in the fight against asthma life, whole wheat bread, whole grain cereals are just a couple of the whole grain products that are thought to help reduce the severity of asthma life symptoms. It is also suspected that whole grain foods help to reduce the chances of getting asthma life. It was also found that fresh fruits, 100% natural fruit juice, and fresh vegetables reduce asthma life symptoms. The basic cause of asthma life is still a mystery to doctors, scientists, and researchers around the world. While research suggests that food allergies play a role in asthma life attacks in young and old asthma life sufferers. Food allergy triggered asthma life attacks give reason to seek out and find the foods that are responsible for triggering these attacks, and the foods that help fight asthma life and its symptoms. Once located avoiding these dietary triggers will be much easier as diets become more personalized and advanced. This will allow concentration on the foods that reduce asthma life symptoms and incorporate these helpful foods into a more healthy diet program. Changing the diet and consuming foods that reduce asthma life symptoms can be extremely effective in the fight against asthma life; such changes should not be made without consulting a medical professional prior to be start of the change. Your doctor should be aware of any treatments, medications, and dietary changes that are currently in effect or preferably before they begin. This information will help the doctor to come up with a more effective treatment program for the asthma life condition, utilizing the proper medications, medical treatment and a healthy balanced diet. There are many different types of allergies that a person can suffer from, but food allergies are one of the most common of all. Food allergies, also known as food intolerance refers to when a person cannot eat a certain type of food without experiencing undesirable side effects or even serious repercussions. Although a person could really be allergic to any food, there are a few in particular that are especially common for causing problems here. This includes milk, eggs, peanuts, soy, wheat, fish, and tree nuts, to name a few. Most people are diagnosed with food allergies when they are a young child because this is when it is usually first noticed, but many people do not realize that they have food allergies until they are a grown adult. Many people wonder how and why allergies actually occur, especially when the condition relates to food. Basically food allergies happen when a person’s immune system mistakenly believes that something the person ate is harmful to the body. As a result it begins to produce certain IgE antibodies to that food, one of these chemicals being histamine. This is the antibody that has the most effect on the body, including causing the eyes and nose to water and itch and the throat to get dry and parched. Of course the most effective method of treatment for food allergies is to avoid the offending food. This can be difficult however, and so there are other treatment methods that can be implemented here, including medication. Medication is not able to cure the underlying food allergy which will most likely be with the person for the rest of their life, but it can help to provide relief of the symptoms experienced as a result of it. There are some people who are only allergic to one type of food and others who are allergic to numerous different foods. It can take a lifetime to determine all the foods that a person is allergic to, especially since chances are that there are certain foods that they have not yet tried. Working together with a doctor is very important here, especially for those people who are dealing with serious food allergies. The doctor will want to keep an eye on their condition and make sure that allergies is the only thing the person is suffering with and that there is nothing more serious at play here. The chronic condition fibromyalgia affects an estimated 6 million Americans. Nobody knows precisely what causes it, and that includes researchers, scientists and doctors. Some people believe that food allergies are to blame. There are those researchers who agree that there are some valid points to the theory; particularly in regards to the relationship between delayed pattern food allergy and non-specific pain syndromes like fibromyalgia. Triggering causes are a reference point when discussing intermittent flare ups in conditions that have symptoms that are mild one day and the next day severe. Why the difference in intensity of symptoms from day to day? One possible explanation is food sensitivities to staple food substances such as meat, eggs, milk, coffee and wheat. Interestingly, one symptom described by those not yet to be diagnosed with fibromyalgia, which comes out after the diagnosis, is that they first noticed something was wrong after having digestive system problems. This hints at the connection between food sensitivity or allergy and fibromyalgia. Another syndrome of symptoms is also known to be connected to food allergies. Not connected at all to the digestive system, this include confusion, aches, skin rashes, irritability, drowsiness, lack of energy, headaches, depression, mental fogginess, muscle pains and weight fluctuations. These symptoms are more associated with the immune system then with a food delay pattern allergy. Scientists have also seen a connection to immune system functions common to both food allergies and fibromyalgia symptoms. This includes complaints such as nonstandard entry into the bloodstream of food molecules, activation of specific immune cells and release of certain chemicals active in immune cells. This is due to the immune system’s ability to recognize foods that are toxic and harmful. There are multiple different symptoms seen in fibromyalgia, and there can be different expressions of food allergies according to the different conditions. Case in point, with fibromyalgia people often experience connected circumstances like asthma and irritable bowel syndrome, both of which can be linked with food allergies. All in all, it is not hard to see why a cause for fibromyalgia has not yet been pinpointed. Ever wondered about the food becoming a cause for a disease? Yes Asthma can be caused due to variety of reasons. One such reason is food. Food if contaminated with allergens, then diseases are very much possible Let us take a look on some of the allergens in food causing asthma attacks. Food or is it Poison? We may wonder whether the food that we eat is free from contamination. May be yes, but in some cases it may not be so pure. In that case, we put ourselves in complete danger of getting some serious diseases like Cold and others like food poisoning and even Asthma. So, Asthma can also be brought out by some contaminations in the food. Normally the sad fact of this issue is that these contaminants are clearly not visible in the food that we eat so we end up consuming it and we put ourselves at a very high risk. Also the reality is not in our side as there are no perfect examples of food items where there contaminations. So finding them is very difficult as well. Also normally the actions of these contaminated food items are very less, so initially it was never thought that they will endanger many asthma patients. Also the effects of Asthma attacks caused due to these foods are significant. So they may not be found in many places, still they can cause a lot of problems. Normally if we see the allergens then we come to know that they are normally chemicals which are poisonous found in foodstuffs. If you happen to see some of the fruits and vegetables, stop and think again as there is always a possibility of them having some added chemicals like compounds of sulphur and the sulphites which can potentially trigger an asthma attack. These chemicals are also found in some bottled wines and shrimps as well. So before you buy it is very essential that you go for the brand rather than the product. Also some undesirable allergens may also be present in day to day common items like milk, eggs, peanuts, tree nuts, soy, wheat, fish, and shellfish. Also other undesirable chemicals are seen in many other food items that we buy. These include other dyes as well. These dyes are very dangerous chemicals just to add colour to the fruits and vegetables which are rotten. The other chemicals include BHA and BHT, monosodium glutamate, aspartame, and nitrites. So we have to better stay aware of these to prevent further problems like Asthma. Leafy vegetables are rich in minerals and vitamins – vitamins A, B, C, K, iron, magnesium, folic acid and so on. These nutrients are all very important for your baby’s proper growth and development. Folic acid in particular, is important to prevent neural tube defects. Fruits are one of the best foods to eat when pregnant. You can use fruits as a quick yet healthy snack. Apples are rich sources of vitamins and fibre. Eating an apple a day is also reported to decrease the incidence of asthma life in children. Nuts are an excellent healthy source of proteins. Instead of eating some high-calorie food for a snack, consider having nuts instead. Nuts such as almonds contain especially high contents of manganese and vitamin E, while cashews are rich in magnesium. You will need increased levels of calcium (1000 to 1300 mg a day) during pregnancy, of which yogurt is an excellent source. Eating low fat yogurt for a snack can ensure proper foetal bone and tooth development. Yogurt is also high in protein and contains good bacteria that helps promote a healthier digestive system. Whole grains are probably one of the best types of foods to eat when pregnant. They are rich in fibre and contain high levels of foliate or folic acid. Low fat cereals that are high in fibre and proteins can provide a much deserved boost to your health. On the other hand, beans such as lentils and pinto are rich in fibre, protein, and tryptophan and foliate, all of which are necessary for your pregnancy. Lean meats are rich sources of protein. One cup of chicken breast contains about 85% of your daily recommended protein intake. Aside from being a good protein source, lean meats may contain selenium, niacin and vitamin B6. When pregnant, you only need approximately 300 extra calories a day to supply the energy needs of your growing baby. This is equivalent to a glass of milk or a spoon of peanut butter. If you want a healthy pregnancy, it is very important not to overeat or you might encounter problems that could have otherwise been avoided. Weight gain during pregnancy must be gradual; it is important to make sure that your choice of what foods to eat when pregnant does not lead to uncontrolled weight gain. If you have a baby, you may be worried about her or him having a baby food allergy. While the quantity of cases of food allergies has enormously expanded during the past decade, the proportion of youngsters and children with food allergies is still proportionately low. However, if you or somebody in your family has food allergies or your baby has been showing signs of a possible baby food allergy, it is important to become educated on the topic of infant food allergies. Any baby who has a food allergy will feel symptoms of that allergy. Common indicators among children are hives, chronic eczema and other food allergy rashes, gas, trots, gut rot, and incapacity to sleep due to over the top irritability. These symptoms are customarily not life threatening and most likely point to a mild baby food allergy. However, continuing to give your youngster the allergen could presumably increase the symptoms and the severity of the reaction in the future. Other more significant baby food allergy symptoms include excessive swelling, Problems or lack of ability to respire, swelling of the throat, lethargy, disproportionate weariness, and even death. If your child experiences any Problems with respiring or swelling or lethargy, call 9-1-1 instantly. Often times these reactions happen so quickly that you simply do not have time to rush your youngster to the infirmary for help or to call your doctor. You need paramedic help instantly. Baby food allergies aren’t common, but when they do almost every one of them is caused by 8 main foods. Chicken eggs, wheat, peanuts, tree nuts (such as walnuts, Brazil nuts, and cashews), soy, milk, fish, and shellfish (like shrimp, lobster, and crabs). If you’re allergic to any of these foods, the best concept is to obstruct giving them to your youngster until he or she’s at least 2 years old. Many allergies in children are a result of introducing the allergen too shortly to a kid. The general guideline is a kid should not have peanut butter until she or he is at least one, and much later if the oldsters or other brothers are allergic. Baby food allergies can be due to early arrival of the food, so it only makes perfect sense to delay introduction as long as possible. What is all about nutrition and diet? There are some nutrition basics you can keep in mind. Mastering the nutrition basics comes down to understanding the concept of a food pyramid and the roles of fibre, fat, cholesterol, and calories in a healthy diet. You can also talk to your doctor or a dietician for adapted dietary advice that takes into account your health status, lifestyle, and food like and dislikes. Water is your body’s principal chemical component. Table salt is made up of the elements sodium and chlorine – the technical name for salt is sodium chloride. Your body needs some sodium to work properly. It helps with the function of nerves and muscles. Your body needs some sodium to function properly. Fibre is a substance in plants. Dietary fibre is the kind you eat. It is in fruits, vegetables and grains. It is the part of the plant that your body can’t digest. Yet it is an important part of a healthy diet. It adds bulk to your diet and makes you feel full faster, helping you to control your weight. Fibre helps digestion and helps to prevent constipation. There is more calcium in your body than any other mineral. Calcium has many significant jobs. Asthma is a respiratory disorder in which the lungs and throat gets compressed, making it complex for a person to breathe. In this form a person gets recurring attacks, which is uncomfortable and worst, it can be life-threatening. Most people with asthma life are always fighting congestion in their lungs. Asthma can occur in anyone, but it is most widespread during childhood and early adulthood. Many things can cause an asthma life attack, including exhaustion, stress, and lung infection and even cold air, but exposure to allergic substances, such as dust and smoke. Although attacks are usually brief, they are still upsetting for child and parent also. Herbs alone can work wonders in helping your child and a few additional measures will contribute to the success of these remedies. Since asthma life is associated with allergies, keep the air your child breathes as clean as possible. Air filters help to eliminate many common airborne allergens: pollen, mites, mold, animal dander and dust. Check that your air-conditioning and heating- system filters are not recycling dust through your home. An alternative to the chest rub is an herbal steam that uses these same essential oils. Add two drops of lavender essential oil to a humidifier in your child’s room or have your child inhale the steam from a pan of water containing four drops of lavender essential oil. Inhaling herbs via a humidifier is one way to deliver herbs to the lungs and airways. As part of an asthma life herbal treatment, a humidifier is a cheap and useful tool. The way to use a humidifier is simply to add essential oils or tinctures to the water. Using reverse osmosis or distilled water is ideal. Glass and stainless steel are better materials than plastic when looking for a humidifier. Some great herbs for inhaling are eucalyptus and peppermint. Both help to dilate the airways, and also have an antibacterial effect. Tea tree oil is highly antibacterial as well. It’s not very common, but it can happen: food allergies can trigger asthma attacks. Not just mild ones, but severe asthma attacks. Living Without, a magazine for people who have food allergies, ran a story about Keri O’Mara. At the time of the article, she was 16 and a track star. But she also has food-related asthma. Her asthma was so severe it was life-threatening. Those who have walked a mile in her shoes know all too well how such a rare form of asthma can affect your life. When your body is allergic to a certain type of food, it can trigger an asthma attack. An allergy is an overreaction to something that is normally harmless. In this case, the allergy is to certain types of food. This overreaction is triggered by an antibody called IgE. It is an allergy antibody. Normally people who are allergic to foods will vomit, get a rash, get nauseous or break out in hives. But sometimes the body’s response is an asthma attack. Most food allergies include nuts, eggs, wheat, shellfish, soy and milk. Sometimes people can have allergic reactions to additives in food too. Additives are used as preservatives in certain types of food, like dried fruit, alcohol, shrimp; anything pickled and bottled lime or lemon juice. First, it is best to avoid any and all foods that you may be allergic to. This is the best way to prevent a food-related asthma attack. Other treatment methods can be discussed with your doctor. If you happen to come in contact with the food unwittingly, you may need an inhaler or an emergency treatment to prevent your asthma attack from becoming fatal. Asthma food allergy is yet another factor that asthma patients should not miss from their endless list of allergens. In the United States 3% of children and 1% of adults suffer from food allergy each year; out of these approximately 30,000 cases of food-induced anaphylaxis and about 150 people die. Food sensitization is mostly prevalent in city inhabitants who have asthma. Researchers found approximately 45% of the children who suffered of asthma and were in the study were sensitive to at least one food allergen and had a higher rate of hospitalization. These cases require more steroid medication to control the asthma food allergy attack. Many food studies have found that certain foods do trigger asthma food allergy and subsequently an attack. Food allergy is referred to adverse immunologic reaction to food. The primary target organs of food allergic reaction are the skin, gastrointestinal tract and the respiratory system. Both acute reactions and chronic disease such as asthma food allergy may occur due to food allergens. To diagnose food allergy requires a careful in depth search for possible causes. Once sure of the cause one can proceed to treatment or elimination of the foods. Food induced asthma is an IgE-medicated diseases that may be caused by indigestion or from inhalation of vapours released during cooking or otherwise. The prevalence of asthma food allergy in the general population is insignificant however; research shows that approximately 5% of children with asthma who have been under study have shown signs of asthma food allergy. While food may not be a major allergen for asthma patients it is possible to trigger asthma attacks. Asthma food allergy is not something asthma patients should worry about at every step but at the same time do not strike it altogether of your list. If you encounter discomfort with some foods that lead to an asthma attack, take immediate action of treating and/or removing those foods from your diet. There are eight food products that causes a major portion, over 90% of food allergies and they are, milk, eggs, peanuts, wheat, soy and tree nuts i.e. almonds, walnuts and pecans. Keeping these products in mind it will help you observe any reaction occurred when or after consuming them. As mentioned above food is not one of the main causes in an asthma attack however, prevention is better than a cure therefore, being careful will only help prevent an asthma food allergy attack in the future. There are more than 10 million individuals who have been confirmed to have asthma, and that’s only in America. Some medical experts in fact think that asthma has reached epidemic proportions due to its pervasiveness. Poisonous pollution and chemicals in the environment are the main contributors to the development of this condition. There have been more and more incidents of people dying as an outcome of asthma, primarily caused by failing to pay attention to the warning signs. Throughout an asthma attack, the air passages in the lungs will start to swell and develop mucus secretions, and will eventually spasm. It becomes harder to breathe as the air passages become constricted. Breathlessness, coughing, wheezing, congestion, a dry mouth, fever and pain are all symptoms that can appear throughout an asthma attack. An attack can be due to almost anything. Upper respiratory infections, overexertion, poor nutrition, and stress are frequent triggers, and allergies are the most frequent cause of an asthma attack. Many attacks are a consequence of contact with pollutants such as pollen, gas odours, smoke, and exhaust fumes. Attacks can also be triggered by foods like chocolate, dairy products, corn and peanuts. They can also be triggered when you take antibiotics, tranquilizers or hormone therapy. There are a lot of herbal, mineral and vitamin supplements that can be utilized to manage asthma. Vitamin B is the most significant of these. Not only can it lower the severity of an attack, it also preserves the biochemical equilibrium in your system. Vitamins A and E utilized together are particularly effective at protecting your lungs from the effects of environmental pollutants. And large doses of Vitamin C have been established to be useful in fighting asthma. Gingko biloba is also a beneficial treatment to improve breathing and alleviate bronchial responses. Another great choice is odourless garlic. This supplement’s anti-inflammatory properties help to lower the likelihood of suffering from an attack. If you believe you may have asthma, see your health care provider as quickly as you can to get tested. Until then, eat a diet high in protein with lots of vegetables and fruits and avoid known causes. Although an asthma attack can be quite distressing, there are choices available to help prevent it from taking over your life. If you’ve been diagnosed with asthma by a health care provider, ask lots of questions and find out what you should be doing to manage your condition. It is possible to prevent an asthma attack, so there is no reason for it to keep you from the activities you enjoy. It can generally be controlled even if it does slow you down for a while. Did you know that asthma affects millions of people around the world? If you’re one of them, visit Asthma Treatments to learn more about what causes the condition, how to prevent it, and how to treat asthma attacks. Today, more and more asthma life sufferers are turning to use more natural ways of treating asthma life. Herbal supplement for asthma life treatment that are now available today have been both evaluated. Asthma can be treated differently and there are many different ways for treating asthma life. It can be treated through medications, inhalers, anti-inflammatory, herbal medications, homeopathy, and even yoga. These different methods can be helpful to one or the other person depending on the intensity. Vitamin supplements also help in treating asthma life. Vitamin supplements containing vitamin B12 is helpful in reducing wheezing and it improves the deep breath rate. Some people also take supplements containing vitamin C as research shows that it has the ability to fight against virus. There are proofs of people benefit from cold symptoms by taking vitamin C supplements and which indirectly is beneficial to asthma life patients. Chamomile, rosemary, spearmint, thyme and cloves contain antioxidants. Asian treatments for asthma life are confirmed by using Ginseng or Liquorice, among other herbs, to treat asthma life patients. Herbal remedies are the most common natural relief, as they come from the earth itself. Depending on the asthma life, these herbal treatments may eliminate the need for synthetic drugs and inhalers. Dry figs: You would need to dry and soak figs overnight. In the morning, take them along with drinking the water that they are soaked in, to help relieve the symptoms of asthma life with phlegm. Consuming dry figs helps to drain off the phlegm, which will make it easier to good breathe. Garlic: Garlic can be effective when used at the beginning of an asthma life attack. Normally, a garlic mixture is taken once daily to help reduce the asthma life symptoms. Vitamin B6: Vitamin B6 has been found to reduce wheezing and other asthma life symptoms. Another natural asthma life relief is BioVent. BioVent is an asthma life remedy used with a unique combination of herbal and homeopathic ingredients. This is used to control and prevent asthma life attacks and is very useful for any asthma life sufferer. Gingko biloba supplements are available and it acts to improve the easy deep breath and aids in bronchial reactions. Try some garlic supplements as it has an anti-inflammatory property against asthma life. When you enter into the realm of supplement brands, you can find vast products meant to act against asthma life, without the drugs.